We will learn how to review and modify the Relationships we have established in our Data Base. The procedure in both cases is similar to the one we use to create it. We click on the Relationships icon. From here, we can see all the established Relationships in our Data Base. We click on the "All Relationships" icon. 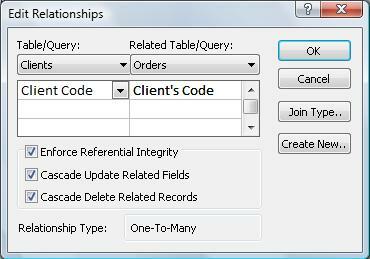 If we want to see the Relationships for a specific Table, we can click on the "Show Table" icon and select the table we want to see. 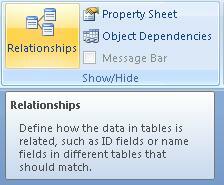 We can Add Tables on the Relationships window and eliminate them by clicking on "Delete" after selecting them. To edit a Relationship, we need to double click on the line that shows the relationship and the Edit Relationships window will appear. To eliminate a Relationship, we just need to place the cursor over the line that represents that relationship, click on the right button on your mouse, and select the option "Delete". 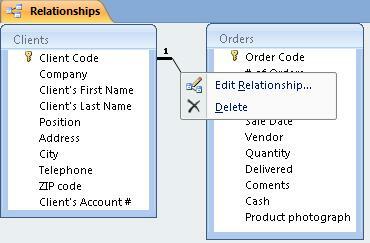 You will notice this also has the option of Editing a Relationship. In the next Lesson, we will learn how to relate several fields in a Table.